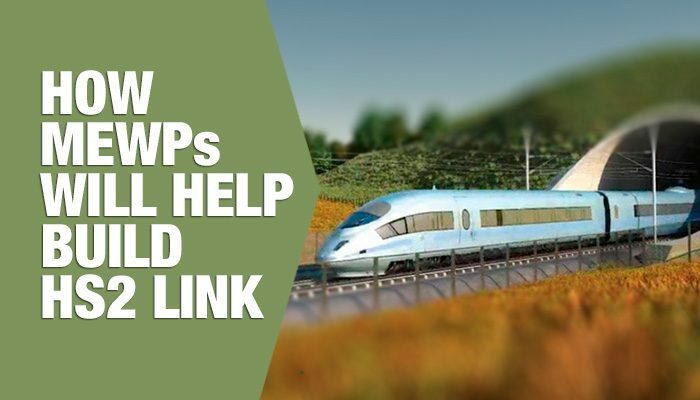 After being given Royal Assent, work has begun on the government’s HS2 rail project across the UK and powered access platforms will be pivotal in both the construction and maintenance of the new line. Contracts worth £6.6 billion have already been placed for the building of the first phase. The first phase of the government’s HS2 rail project will be from London to Birmingham and operational trains are expected by 2026. Phases 2a and 2b will follow with services from the West Midlands to Crewe due in 2017 and then from Crewe to Manchester by 2033. Jobs that overrun on the railways can be expensive. They have a knock on effect on services and commuters so safe, rapid access to the track is vital. Road rail access platforms are specially adapted to run on the road in addition to the rail infrastructure. This provides a flexible solution so jobs can be reached and completed quickly, and also safely, with minimal impact on the surrounding environment. Having the ability to operate on road and rail tracks does not reduce the speed or functionality of the equipment. It is easy to switch from one operation mode to the other and it saves money as well as time. This is achieved by reducing the need to hire locomotive plant or attempt access through protected or remote areas of countryside. Many locations along the route of the new HS2 high speed rail track are hard to reach. There are limits to the usefulness of trucks and tractors for a number of essential construction and maintenance jobs. A road rail powered access platform is a flexible, cost effective and safe solution that will enable crews to access difficult places and carry out challenging jobs, quickly and safely. It’s the time of year when high winds blow leaves and fallen debris around. This causes serious problems in terms of safety and delays for commuters. 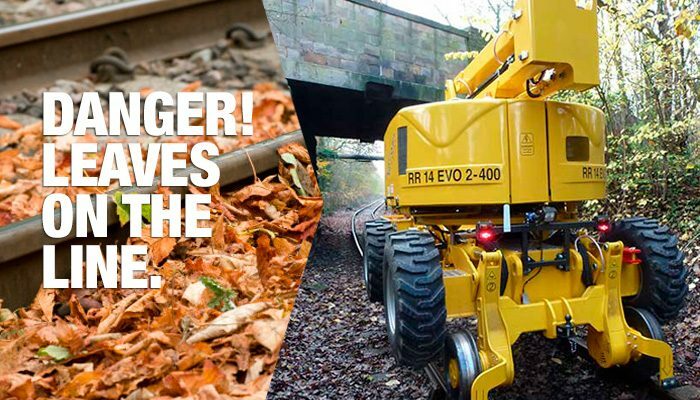 Keeping vegetation under control is an essential job on the UK’s rail network and access platforms for railways play a vital role throughout summer and autumn. Fallen leaves, overgrown grass verges, and overhanging branches are a hazard on the railways. They cause signal and track obstructions which will delay services, inconvenience commuters and pose a risk to health and safety. Many miles of UK rail lines are in hard to reach rural areas. road and rail access platforms have overcome this problem and operate on both road and railway in urban and rural environments. This saves time and money, making maintenance work significantly safer. Modern access platforms for railways are safer, stronger, more robust. The flexibility to operate on roads and on railway line means the machines are able to cope with a variety of tasks in a wide range of different locations and environments. Speed and performance are not limited by the dual functionality of access platforms for railways as they can switch easily between the two operating modes and they have a minimal impact on the countryside and environment. Many miles of railways track run through remote rural areas of the UK where, during summer and autumn, trees, leaves and vegetation can pose a risk to safety by causing an obstruction or obscuring vital signals and signs. Accessing some areas and keeping on top of the growth can be a challenge, particularly during late summer and autumn. access platforms for railways offer a fit for purpose and safe solution to clearing and maintaining railway lines to ensuring there are no expensive delays and inconvenience to passengers. An outside access platform in wet and windy conditions will require extra precautions to avoid accidents. In these weather conditions the risks of instability, falls and over-tipping are increased and the number of accidents rises as people fail to compensate for the adverse conditions. Even all-terrain and off-road access platforms can fall prey to wet weather problems and potential hazards may not be obvious as conditions can change mid-job. The violent storms and hurricanes hitting the Caribbean and Florida at the moment are a powerful reminder of how devastating nature can be. 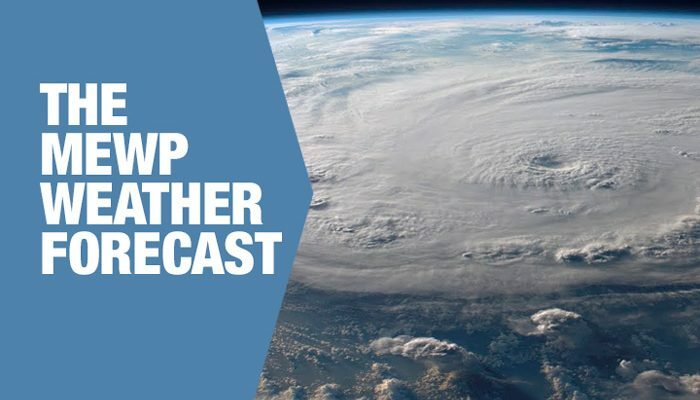 Although on the other side of the world, the two month forecast for the UK is for the tail end of three hurricanes to arrive with heavy rain and high winds up to 100mph. The Work at Height Regulations 2005 – This requires a detailed risk assessment to be carried out at the job location before starting any work at height. The risk assessment should be reviewed at regular points throughout the job. The Provision and Use of Work Equipment Regulations 1998 (PUWER) – Managers and employers are obligated to prevent or control the identified risks. The legislation includes a whole section on over-tipping and considering ground conditions in relation to the requirements of the job. All staff that operate powered access platforms must be properly trained in their use. This training includes identifying potential hazards and avoiding them and handling rescue situations should the need arise. This is a primary consideration in wet weather as it could be crucial to the stability and safety of the access equipment. Both the stability of the ground under the weight of the machinery and the possibility for changing conditions, for example on sloping ground, should be considered. Spreader plates may be necessary to stabilise boom lifts and heavy access platforms. As well as the location of the job, the ground conditions to and from the site may pose a risk in heavy rain. The access route can pose a number of hazards including underground dangers, sloping ground or uneven surfaces. Sloping ground is a challenging work surface in dry weather and can become dangerous and unstable in the rain as the surface of the ground can wash away on steep hills and gradients. Overturning accidents on grass verges, and steep bankings beside roads and train lines are more common in wet conditions. Falls are the most common cause of serious accidents and injuries involving access equipment. In rainy conditions the basket or work platform may be wet along with the surrounding work area. It may be necessary to take extra care and also use additional safety equipment such as a harness. With heavy rain and gusting winds forecast it is important that UK operatives of powered access platform are prepared and confident to use the equipment in wet conditions. With the UK forecast predicting deluges and powerful gusts over the next few months, it is vital that all those responsible for the safe operation of an outside access platform become their own “weather watchers”. Accuweather provides global forecasts. More locally, The Met Office provides long range forecasts . 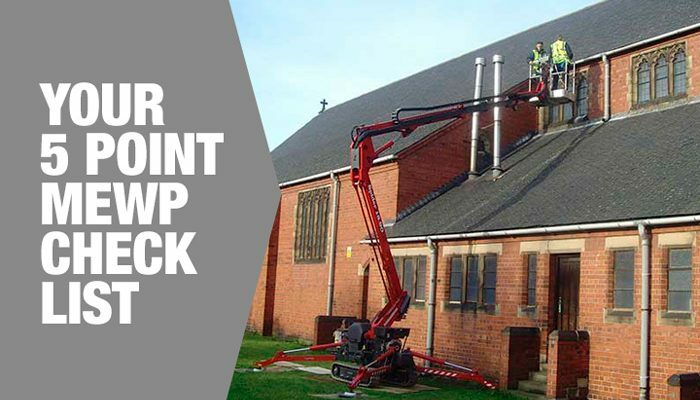 If you are considering using a powered access platform for the first time, here’s a five point MEWP checklist to help you get started. Although powered access platforms are safe and easy to operate there are still some important things you need to know about safety and the law. It doesn’t matter if you are using the access equipment for public or private work, the considerations are the same and being prepared will make any task safer, faster and easier to complete. So here it is our 5 point MEWP checklist. Under UK law, anyone using access equipment for any purpose must be trained in how to inspect and operate it, and recognising and avoiding any dangers or hazards. They should also be familiar with the specific model of access platform that they are using. It is the responsibility of employers and individual users to make sure they have completed the training to comply with current health and safety legislation. Promax Access can guide you through the maze of Height Safety Training Courses and Legal Obligations. All operatives need to be aware of potential dangers such as overhead power lines, ground conditions, obstructions and stability issues, so they can avoid any risk to themselves or anyone else around the job site. A detailed record should be kept of the risk assessment including inspections of the equipment and the use of harnesses if necessary. As circumstances can change, the risk assessment should be reviewed throughout the job. More information about Risk Assessments may be found at the Health and Safety Executive website . Promax Access have been raising the standards in powered access solutions for over 15 years. They can provide help and advice in choosing the right equipment. For most outdoor jobs, ground conditions are linked to the weather which is impossible to control. They can vary on different areas of the same site and are changeable – wind, rain, ice and sun can all cause instability – so they need to be monitored throughout the job. Sometimes a geotechnical survey will be required to identify underground hazards such as sewers or services. Never underestimate the importance of physically checking the on-site ground conditions before deploying any MEWP. It’s the law to have access equipment tested and thoroughly examined by a qualified person every six months for machines lifting people and 12 months for those lifting just equipment. Both new and used access platforms should be fully serviced and maintained to meet current health and safety legislation and ensure jobs are carried out safely and more efficiently. Without a valid LOLER certificate, you should not use your machine. Promax Access off a free LOLER Reminder service . Faster, safer, easy to use – there are lots of benefits to choosing powered access platforms over ladders or scaffolding for most elevated jobs but the benefits will only really be gained by ensuring they are properly used. Get properly trained, choose your equipment wisely and be aware of the potential problems that can hold up a job and powered access platforms can save time and money on jobs of all sizes. Get free advice. Call Promax Access on 01226 7166657 and talk to an expert.